Edward Wormley's famous La Gondola sofa. One of the best sofa designs of the entire modern design movement. Expertly refinished and reupholstered in a light to medium grey mohair. Plush and elegant. The frame may should some slight signs of wear, but this has been expertly reupholstered and refinished. 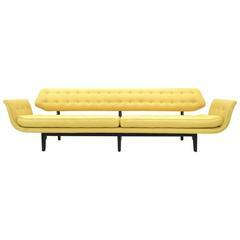 Classic Edward Wormley three-seat sofa. Fully restored and reupholstered in an elegant light gray / grey fabric. Buttoned back behind down filled loose cushions. Large-scale "Janus sofa" by Edward Wormley for Dunbar. Wide angle sofa model #6329. Fully restored. New mohair upholstery over refinished mahogany base.